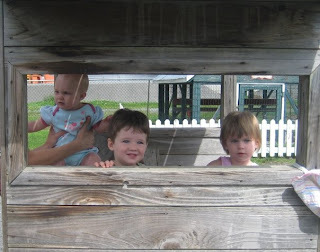 My cousin Tyler and his family came up to visit for a few weeks; here is a picture of his 2 little girls with Julien at valleyview animal farm...they seemed to enjoy themselves! 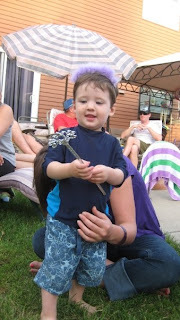 His oldest daughter turned 2, and one of her presents was a fairy costume - which Julien wanted - here he is with the tiara and wand! The next few weeks don't seem to be as busy as the past few. We are heading out to Saunders Critters next week with a friend and her 2 children, so that should be enjoyable.....and we are in the midst of getting quotes to have our laneway redone.....hopefully we can get it done in September.